Heavenly blog! : No. 944: The most positive aspect of the collusion between Torp and Manglerud Police, through this I get the opportunity to teach that remarriage is adultery for believers! No. 944: The most positive aspect of the collusion between Torp and Manglerud Police, through this I get the opportunity to teach that remarriage is adultery for believers! The most positive aspect of the collusion between Torp and Manglerud Police, through this I get the opportunity to teach that remarriage is adultery for believers! It is obvious that the whole thing is based on a "robber story" of Torp to stop me and the Heavenly blog. But he will never succeed! Manglerud police have no clue revealed about what religion and freedom of expression includes when they want me to court! Deep thinking is this arrogance at its very worst. Religion and freedom of expression is a freedom that has been fought through several centuries, at least. And then almost as a branch of a police office put themselves above this law and get taken me? Ha-ha, how funny can be? It's like some dad boys. They think everything is a matter of course, but everything is hard work behind. Never in my life if I'm going to stoop to such rigid and proud people. This will bring Norway back at least 200 years if they had won forward with what they're doing. Illustrative image of a "daddy-boys" who have taken everything for granted. But religion and freedom of speech is a matter of course, it is hard work behind it. And it should be preserved, so it is still important not to take this for granted with such police officers as one finds in the "branch" in Oslo. And I do not need to explain either why I believe what I believe. I have the rule of law and to defend ORDER TO EXTERNAL AND cuRRenTS WHAT I DO! Yes, there had been very smoothly. But I would have done something about it. And thought that the problem is me and not the one who says it. It is about tackling what others think. Either open up for it or shut it out. And such statements are streets within its belief and freedom of expression. Anonymous why bounced all allegations of Jesus? He was accused of being a liar when he claimed he was God's son. Be demonized when he healed the sick. His doctrine of Satan when he was not theologically trained. What if you had small children and they Googled your name, and they found dozens of places where it was that you were a "whore buck" and their mother was a "whore" ????? Anonymous you not answering my question. And you turn everything on the head. I have not made a single problem for Jan Aage Torp. All this he has created himself. My kids had laughed at such comments and they know that all this had been a lie. Why? They have trust and confidence in me. That the kids of those who are divorced and re-married do not have it is not so strange. They put their own needs ahead of God's word and the kids! Anonymous there is no human right to be a preacher. Torp neither teacher nor live by God's word. He has always judged the second bust home. When he sits in the wax so he demands to be taken carefully as possible. Can not you see that this is what Jesus said with what measure we weigh others we will even be measured with. Glad that you could not answer anonymous. You turn everything on the head and see things from a selfish and self-centered point of view. And when I contradict you, you have nothing to bring except to come up with new crazy and unreasonable answers / teachings. One will get a totally absurd world if one is not allowed to mention that some are psychopaths, false prophets, narcissists, nasty, ugly and other negative things. And then discern they possibly are allowed to call for this, and they're not allowed to call for this ??? 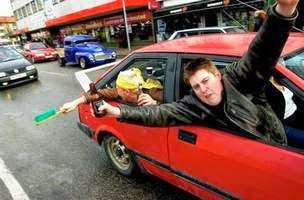 Here Manglerud police (I keep on laughing myself to death over people like this ha-ha) who should control here! They can not even have to remove the fake blog that writes my name and see that there Torp has made false accusations against me. Or they see it but pride prevents them humble themselves that they have made mistakes and really been fooled by a fool last ?! They put themselves above God, Norwegian law and everyone and everything I see. Here's arrogance and control the spirit on top, poor people! Adolf Hitler undoubtedly was a psychopath, but believe that there are other psychopaths is like believing in Santa Claus. Unfortunately, there are thousands, and they are public figures then it is perfectly legitimate to name them. That is why we have Faith and freedom of expression for and properly police and judiciary do not work against it. But defend it and stand up for free speech that is not threatening and violent. We can not be allowed to say that a person is a false apostle, but one is not. We can not be allowed to say that a person is narcissistic, but it is not so. Can we say that Hitler was a psychopath, so we can use it on others etc. We can use all the words and expressions as long as it does not go on truing, bullying and incitement to violence. And I have just pointed out that a public preacher is exactly opposite one the criteria that the word of God sets a Pastor / Shepherd! That this is a criminal offense? No way, this is the word of God, nothing else! The more I put myself into this topic, I find out that I have 100% right in all my statements on absolutely every way, while police at Manglerud acting just as they are in dictatorships and similar states. I will deflect? Never. If they are going to offer that I should pay $ 1. Or 1 Million. 1 day in jail or one year, it is exactly the same. Police acting like they were in North Korea and dictatorship state. But Norway is a rule of law, democracy and everything else that is wonderful, just great! Fairness principle applies not to the police at Manglerud? If I can described a person who psychopath false apostle etc. But it is not allowed to mention another like it? Hope the police realize sooner rather that they do not have any case against me. But I soon became a very good case against them when they are totally unprofessional and act like we live in a dictatorship here in Norway. Hope they come to ask for apology and pulls the whole affair! For everyone's part is only to be hoped that they withdraw the case, requesting excuses and get their work done to track down these people who have caused us guilt and your new blog with this person who is poor a psychopathic case who invents story about me as I type or a certain Arne Breen, and incidentally. If he continues to write does not really matter when all that is a bit normal and up and running know that everything is just nonsense and nonsense! That's where the crux is. Everything I write, speak and doing hits the nail on the head. While there Torp and other're doing is to laugh. Torp has called for blockhead, stalker, like liar and 20 to 30 different things that are much worse. But what do I do? Laughing at all the stuff when all Torps words fall like dead down to earth! I have a lot more in store for both the one and the other. I grow every day when I realize more and more of the whole matter. And I'm not going to write about this so much more until further notice, but other things. Apart from that, I'm certainly going to lay out some of the fun last psychopaths, false apostles and others. Torp is I finished. Actually an interesting case. Although he is quite ill as he said about someone who had given him 1.5 Million. I have never met Satan. But through Torp so I've really got to learn to know him. That's why I've written a lot about this. We can not see Satan, but we can through the people who walk in a way that is not the biblical way to see how he operates and is. Jesus said ia that they had the Devil Father and so I think it is. So are many such people who walk in darkness, but confess Jesus name without living by his teachings what we would call animated by the powers that binds and creates the uncanny that we are now witnessing. One is under demonic influence word of God says! False apostles, we find several places in the word of God. Ia spoke the apostle John to the church at Ephesus about this. Here suitable course Torp as constantly led by prophecy but not the word of God. And all prophecy has of course no one turned to or been neither the word of God or reality. Even Minos prophesied over him a huge mega church here in Oslo, larger castles in the air of prophecy has probably never occurred. Narcissistic and lie is this, and it throws only fly in the eyes of the people and they are misled into spiritual darkness that Torp even located and is in! Regarding the traction that Torp has, he is probably partly excused when my experience is that they are so special is born that way? But what there is no excuse is keeping me such persons as police Manglerud do! And there is no excuse either to remarry after a breakup. Will be a follower of Jesus as a simply not allowed to start a new relationship after a divorce. Make a so word of God says that living in sin and adultery is an adulterer. This is said not what I teach, but what Jesus and Paul taught and learned, and the words are forever fixed. Even for people having defects and features not of the great variety. Will be a believer, then you have and one should stick to Christ and God's word! And I have never claimed that Torp is something else is anything that a doctor etc. But after many years of study, working with people and other, So he has most features that testify to this. Then it far, far understand religion and freedom of expression to be allowed to call such a person for what he is. And here is no been threatened or otherwise. But through this as Torp and Manglerud corrupting beach, so I get an opportunity like never before to proclaim and point out that after a divorce remarriage adultery for a Christian. And the person who does it is either an adulteress or adulterer and adulteress word of God says. One simply live in sin and have come away from grace! Matt. 19. 6 So they are no longer two, but one flesh. Therefore what God has joined together, it let not man separate. "Know ye not that the unrighteous shall not inherit the kingdom of God? Be not deceived: Neither the sexually immoral, nor idolaters, nor adulterers, nor men who allow themselves to use sodomites or men who commit fornication with men ... shall inherit the kingdom of God. " - 1 Cor. 6.9. Rom. 7. 2 For the woman is bound by law to her husband so long as he lives; but if her husband dies, she is loosed from the law of her husband. 3 Therefore she called an adulteress if she, while her husband lives, marries another man; but if her husband dies, she is free from the law, so that she is no adulteress, though she marries another man. The most positive aspect of the collusion between Torp and Manglerud Police, through this I get the opportunity to teach that remarriage is adultery for believers! Should I succeed, I will continue as before. Should I lose, then we go against dictatorship and very straitened circumstances for Christianity in Norway. It will be the beginning to the end! Therefore, this essentially religious persecution, nothing else!